Such a Summer inspired look in Spring haha! The sun was shining through my window and thats what awoke me today, how lovely! 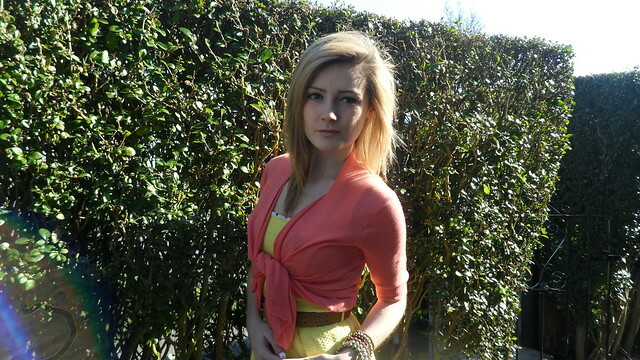 Decided some photos in the sun, outside was a must for today considering it's been the first real sunny day in England of 2011! Anyone else feel that tad brighter and happier when the suns shining!? 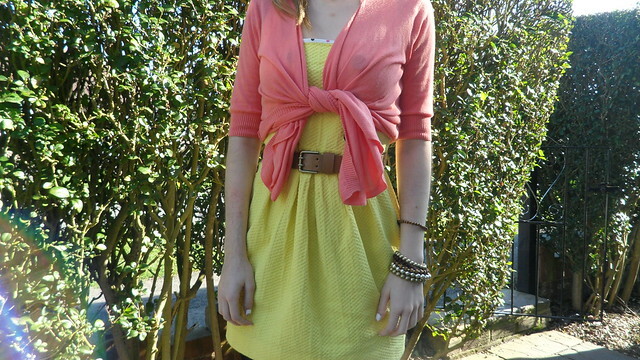 Decided to whip out this dress which i've had for about 2 years now, it's so bright and still in amazing condition! 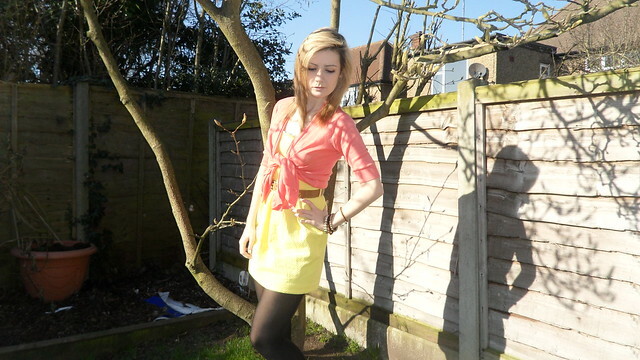 Belted it with a belt from Topshop as it sat quite boring on it's own. 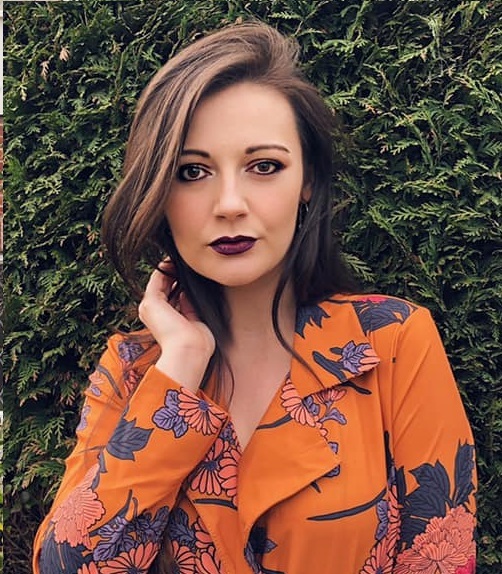 Found this coral coloured cardigan which drapes at the front and has no buttons, so decided to tie it just above the belt for a cute girly edge to the outfit. Wearing a selection of gold, beige and brown bracelets from a variety of stores too. Uploading these photos was actually such a pickle today! I put my adapter on the floor on top of my laptop, went to take my photos, came back, and it was missing. Fairdo's, it's quite a small card, but i most definately placed it on top of my laptop. I came to the conclusion that one of my cats thought it would be funny to play it with, and therefore i lost it. Me & mother searched everywhere for it! In the end we went and bought another one, but that's not the point.. i was well annoyed! I planned to do an early blog post for once, but no.. i haven't been able to blog till now as i've only just got the adapter! 4 hours later.. blog post is in the making haha! Long day tomorrow which i am not looking forward to in the slightest! Fracture Clinic at 9.15am, which means i've got to be up major early! Then i've got the dentist in the afternoon and i know i need a filling. No going to be a good day.. practically praying that i get good news about my wrist! Hope you all have a good week lovelys! My favourite among your outfit posts. 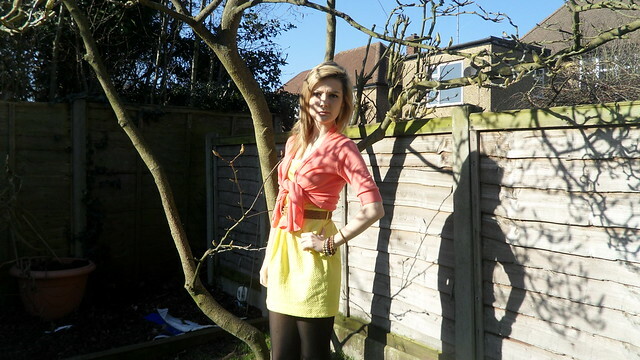 Love the yellow and pinky coral together - it's definitely a 'hello summer are you there' outfit - quite rightly so when it's sunny! hope you can visit and follow back if u like my blog!! !